Another bumper number with some particularly good photographs. 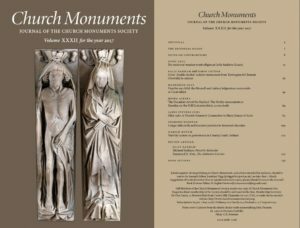 Twenty five years ago, Jon Bayliss wrote an article for Church Monuments carefully describing and cataloguing more than one hundred monuments by Richard and Gabriel Royley, tombmakers (fl.c.1546-c.1600). In his introduction he concurs with the adverse judgements delivered on their work by prominent authorities on British sculpture͛, but then also puzzles over the conundrum first asked by Esdaile: why if these sculptures are so poor, were the sculptors so successful? 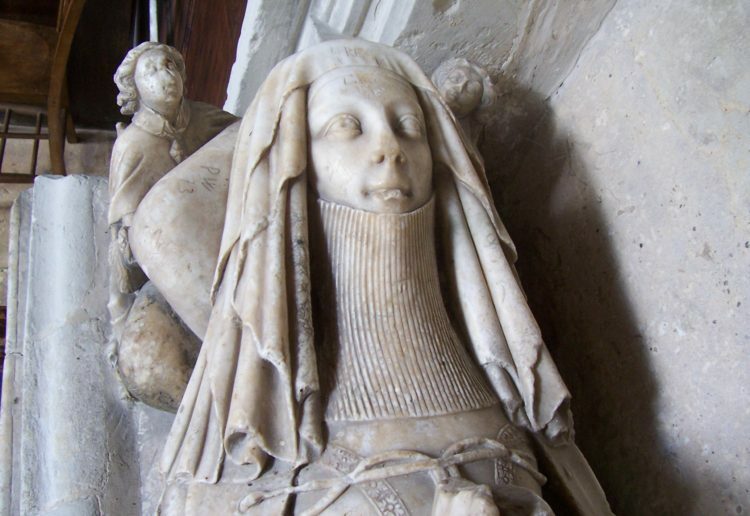 This essay explores the roots of the negative evaluation of the Royleys͛ work and will then use the Shirley monuments at Breedon as a case study to offer an alternative account exploring how the patrons, makers and their contemporaries may have judged these sculptures themselves. Of the 47 cadaver monuments of various types known to have been produced in the pre-Reformation period, among the most spectacular were ‘double-decker’ tombs, mostly carved stone biers displaying on the top level the recumbent effigy of the commemorated au vif with an effigy au mort on the bottom level. Seventeen double-deckers survive in England, but more lost examples are known of through antiquarian drawings and the testamentary record. One example in a will not previously discussed in print is the lost tomb monument at Terrington St Clement in Norfolk requested by William Derby (d. 1438). The precise form of the monument and the context within which Derby’s monument was provided are examined. The contribution of the Low Countries to the huge legacy of European funerary monuments is universally acknowledged, not least to Elizabethean, Jacobean, Caroline, Carolean, and later periods in the British Isles, where many talented sculptors of Flemish extraction settled and produced numerous outstanding works that enrich our cathedrals and churches. The city of Antwerp, despite many vicissitudes, still contains much historic fabric that has survived major upheavals: this paper deals with a remarkably rich late-sixteenth century early-Baroque church monument that for some strange reason has been somewhat neglected in recent literature on funerary sculpture. Considering its relevance to English and Scottish history in the 1570s and 1580s, and especially to the diaspora of English and Scottish recusants who settled on the continent after the execution of Mary, Queen of Scots, this neglect is very odd, so the present contribution hopes to make good a curious omission. This article is a brief introduction to a school of ledger stones in Somerset parish churches in which the memorial inscription is framed within a pattern of elements drawn from classical architecture. These do not seem to have been previously recorded. Made of Blue Lias limestone, and ranging in date from c.1630 to the 1790s, they are most common in south Somerset churches, with further examples in Dorset as far south as the coast and a few in Devon and Wiltshire. The parish church of Llantriddyd in the Vale of Glamorgan has several late sixteenth-century cross slabs, four of them asking for prayer for the souls of children from the leading local landowning family, the Mansell/Aubrey family of Llantriddyd House. While post-Reformation cross slabs are surprisingly common in south-east Wales, such an explicit request for prayer is unusual. However, there is nothing to suggest that the Mansells and Aubreys were ever overtly recusant Catholics. These slabs are an extreme example of the combination of traditionalism and loyalism which characterised the Welsh response to the Reformation. Tucked end-to-end in low recesses along the south wall of the nave at Little Baddow (Essex) is an elegantly carved pair of wooden effigies of an early fourteenth-century civilian and his wife. It seems very likely that the two effigies are not those for which the recesses, with their heraldic decoration, were originally intended. It is argued here that the recesses were probably commissioned for Sir John Filliol, lord of one of the manors in the parish, and that after his death and the subsequent extinction of his line they were taken over by Richard de Messing, a Londoner who had acquired interests in the parish, for his use and that of his wife.